In this game you will take part in the really cool tournament. Yeah! It is soccer! Choose the captain and your team and win this championship right now! Just choose the best team for you and show us all your skills. Have a lot of fun here! 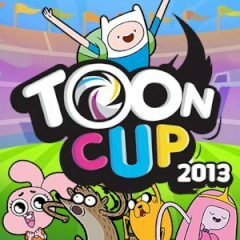 Are you ready to play the most exciting soccer with Finn and Jake, Generator Rex, Gumball, and Rigbi Mordecai and all the other characters from Cartoon Network? Here you have to choose your character loves you the most moreover, to participate in football after particularly difficult and complicated that you have times the number of times you get to win these sports events they have. You can use arrow keys to move, x to get the ball, z to pass. So, would you like to be the best soccer player? Then do not waste your time and play it! Good luck!